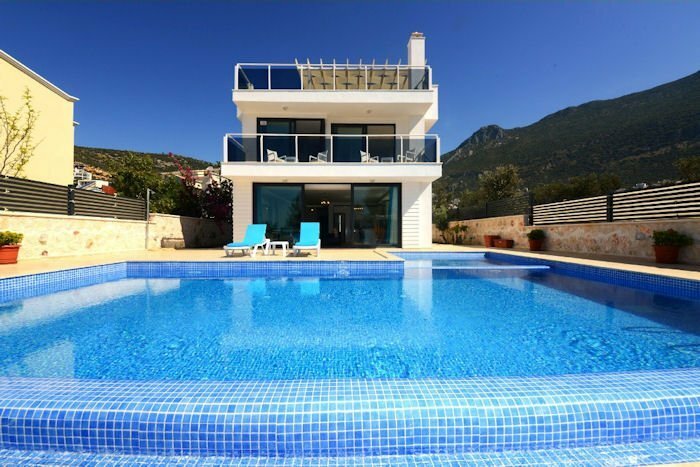 Villa Demokrasi is brand new villa in Kalkan has stunning sea views over Kalkan bay and easy access to the village and all of its attractions. Villa Demokrasi is brand new villa in Kalkan has stunning sea views over Kalkan bay and easy access to the village and all of its attractions, as well as the weekly market and local transport facilities. Holiday villa in Turkey has 3 floors and features 5 bedrooms and 5 bathrooms and 1 cloakroom in the living room, and sleeps 10. This is the place to be for ultimate relaxation with large and airy rooms, spacious balconies plus a large private sun terrace with private swimming pool and private gardens, plus a doored double garage below. Villa is fully fitted kitchen which is fridge/freezer, oven, hob, microwave, dishwasher and toaster. Dining table is for 10 people inside and outside by the pool. Also there are 10 sunbeds with umbrellas by the pool terrace and wood pergola shade. All bedrooms are en-suite and have large private balconies/terraces. Villa Demokrasi is air-conditioned throughout and there is a flat screen TV, a DVD player and unlimited WiFi internet connection. Villa Demokrasi has unbelievable panoramic views and beautiful private swimming pool, however you will want to spend much of your time outside. The pool is surrounded by a spacious patio area, equipped with sun-loungers and sun-shades. The villa is perfect for families and larger groups. Sunbathing area, private swimming pool, private garden, stone built BBQ, pergola sunshade, outside dining table and chairs for 10 people and outside seating. Infinity swimming pool size is 5m to 10m, deep is 1.60m. Fully fitted kitchen is situated off the lounge area and its large and well equipped. Set to do side of the lounge is a raised dining area with a large table and comfortable dining chairs (Seats 10). Kitchen is modern and good design, there are everything what you need during your stay. The lounge designed for your comfortable and relaxing. There is unlimited internet access for you. * The utility room has a washing machine, drying rack, iron and ironing board is accessed via the kitchen and living room. There is a downstairs cloakroom on this floor as well. Bedroom 1 is double bedroom and an en-suite, vanity unit, fitted wardrobes. Room has a private balcony overlooking the fantastic Kalkan bay with amazing views. Bedroom 3 is a double bedroom with an en-suite. Vanity unit, fitted wardrobes. Room is a lovely and light as its triple aspect and also benefits from a private balcony and has amazing views.